May | 2013 | So.....What's the Point? Denial. We all do it and have since Eden; spiritual/moral failure is hard to accept and we don’t like feeling guilty. One sign of denial is making excuses and/or reframing the facts so a story has a different ending that casts us in a positive light. Such is the case with Aaron when Moses asked him how he allowed such idolatry to happen in his absence. Here are the passages we need to see. Note especially Ex. 32:3 and Ex. 32:24. 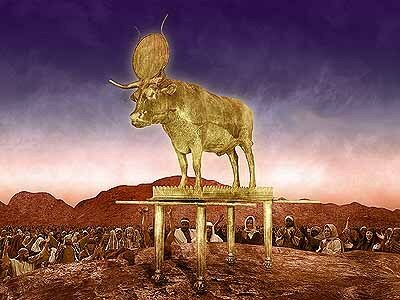 That Aaron engages in the one sign of denial mentioned above namely making excuses (he blames the people) and changing the story about what really happened (the golden calf just came out of the fire on its own) seems clear. It’s not too difficult finding the same kind of denial of idolatry today. When confronted with idolatrous practices there is this common response: “Idol’s, what idols, we don’t see any idols; what we worship is God, so go away” when in fact they are all around and actively being supported in ways this series has suggested in past blogs. When this is the case, the imperative to “flee from idols” doesn’t register because there are none to flee from, at least that’s the party line. So, false doctrines, sexual immorality, covetousness, personal kingdom building, narcissistic self-promotion and blatant disregard for the spiritual needs of people run rampant in so-called ‘Christian’ churches. All of this creates a contemptuous disdain towards the Christian faith by those we hope to reach with the Gospel. In short, we are ‘shamed’ and should be ‘ashamed’ (Ex 32:25 NKJV). We should carefully note the reaction of Yahweh; He was set on destroying the whole nation in one fell swoop and called the people “obstinate” (NASB) and “stiff-necked” (NKJV), not very complimentary indeed. The Hebrew word used for “stiff-necked” means, among other things, the rebellious resistance of oxen to the yoke making it difficult, if not impossible, to plow a field or haul a load; while the driver wishes to go one way, the rebellious oxen pull in another direction. It’s worth looking at Exodus 33:3, 5; 34:9 also because this same assessment of Israel is repeated. Of course, we know Moses interceded for the people, judgment was averted for the time being (Ex. 32:34) but many perished nevertheless (Ex. 32:28). Although the context suggests an eschatological judgment, the point nevertheless remains that before the church can ever hope to be effective at denouncing sin in general, and idolatry in particular, it itself must ‘clean house’ so to speak lest it be rightfully condemned as hypocritical. After the unexpected defeat at Ai Joshua was distraught and God revealed to him that “Israel has sinned…and they have taken some of the things under the ban and have both stolen and deceived.” (Joshua 7:11italics mine)) Eventually, when Achan was confronted he confessed that he “saw among the spoil a beautiful mantle from Shinar and two hundred shekels of sliver and a bar of gold fifty shekels in with, then I coveted them and took them… (Joshua 7:20-21 italics mine). This was the sin of idolatry in the form of covetousness (recall Col. 3:5 from a earlier blog) accompanied by lying (read ‘denial’) that brought defeat to Israel and severe judgment on him and his family. It is important to note that even though it was Achan who committed the sin, the whole of Israel was implicated in the disobedience and suffered a national defeat verifying that indeed “a little leaven leavens the whole lump” (1 Cor. 5:6-11). Here, Paul is clarifying what he had written in an earlier correspondence and tells the Corinthians to have no fellowship with a “so-called brother if he is an immoral person, or covetous, or an idolater, or a reviler, or a drunkard, or a swindler-not even to eat with such a one.” The parallel between a church and Israel is clear: even though a few are engaged in idolatrous activities and deny it all, the rest of the members are equally implicated by denying what is going on before their eyes. I daresay that many churches would see a precipitous drop in membership if Paul’s admonition was taken seriously and acted on. And, I might add that maybe, just maybe, the apparent success of many churches and their leaders is because of the idolatrous practices suggested in past blogs; if so success is really defeat. Why? Because such practices appeal to the narcissistic self, the very root of idolatry, and by giving Christian approval to the activities of this ‘self’ idolatry becomes the norm and therefore remains hidden, at least until someone like Joshua has the courage to expose it. Something to consider at least in these last days.